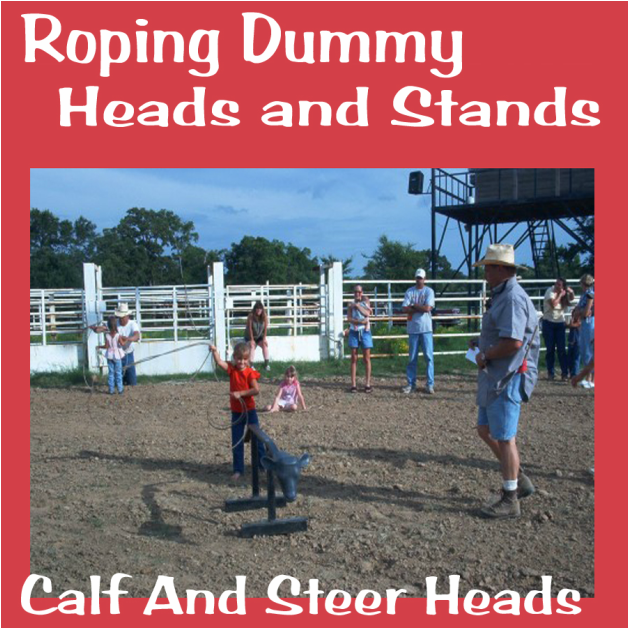 Find roping dummies to practice calf or steer roping, kid's dummy roping or western party. I love the sport of rodeo and it has always been a part of my big part of my life. Calf Roping and Team Roping are two of the events that my entire family enjoys. Roping events are not easy and take a lot of practice, but it is just not practical to take every swing of the rope from on top of a horse, so we use dummies to practice on. One type of dummy is made from a hard plastic calf or steer head shape that can be mounted to a stand or a bale of hay. There are metal prongs attached to the back of the heads. Just push those into the hay bale to secure the head. When I was a kid, we didn't have these heads. Our roping dummy was made from a wooden sawhorse with a short board extension on one end to serve as a head or we just roped the hay. That's still ok and so is roping anything else that happens to be in front of you, but you can get some good practice in on a dummy that closely resembles the size and shape of a animal. We have had these roping dummies for a long long time and they set out in the weather day after day. They have taken a beating from loops that didn't quite go around the head, but they still look as good now as when they were new. As with many family traditions, my kids and grandkids also learned to rope. You will see in the pictures below that we have both the calf head and steer head sizes around the house. The dummy head in this picture is attached to a homemade calf that we made from pipe. Then there is the homemade horse. So What If You Don't Know How To Rope? As I mentioned, the skill of roping was handed down in my family. Fortunately, for someone wanting to learn to rope, there are lots of videos available that will help get you started. Here is an excellent video for the beginner wanting to learn to rope. It applies to adults or kids. These roping dummies now have an event of their own call Dummy Roping. It is great fun for kids and mine have entered them before. If you're interested in having your kids participate, check the details for a rodeo or fair nearby. Many times they will have Dummy Roping and Stick Horse Barrel Racing events for kids. You can get a good idea of how this works in the videos below. My grandkids started out with regular size ropes that my son and brother had. There are some smaller kid size ropes available though. There is also a roping dummy set that is scaled down. It is a smaller version of the steer head and comes with a 20 foot rope. I would still not hesitate on getting the regular size for kids. Even though the ones we had were not bought specifically for the kids, that is what we had. That is what they roped also and they were just fine. Here is an example of how a roping dummy was added to a ordinary sawhorse. You can make your own stand like you have seen in my photos or in this video and of course you can use a bale of hay. There are some stands available that are made to work with the heads. This is a collapsible stand that will fit most size practice dummy heads. This also comes in a junior size. This roping dummy has it all. The body part swivels and the legs swing so partners can practice heading and healing at the same time. Get Some Roping Tips And Practice Drills From Speed Williams. Roping dummies are always big fun at a western party or event. Set up one and let your guest have a chance at being the champion roper for the day. Free printable pages with rodeo events including calf ropers.